Six people did after eating a barbequed dog carcass. CAMBODIAN HEALTH OFFICIALS have been sent to a northeastern district where 10 people died and more than 100 were sickened in two separate incidents linked to the consumption of dog meat and rice wine, a medical officer said. Kratie provincial health department chief Chhneang Sivutha said experts from the UN’s World Health Organization were also investigating the incidents, both in Snuol district. He said people in the province have been warned not to eat the meat of animals that have died from illness or poisoning, and not to drink any wine that has not been properly inspected. Six people died last Sunday after eating the barbequed carcass of a dog that had died for unknown reasons. The four others died after drinking rice wine on Tuesday. Food safety is not a priority in Cambodia, one of Asia’s poorest countries. The country has had to grapple with bird flu, with 56 confirmed cases of human infections since 2003, 37 of them fatal. 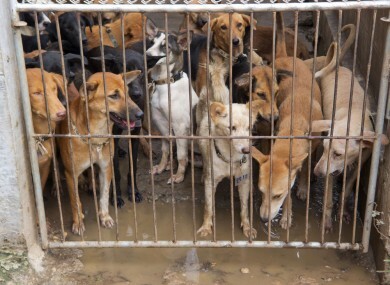 Email “Ten Cambodians die after eating dog meat and drinking rice wine”. Feedback on “Ten Cambodians die after eating dog meat and drinking rice wine”.